A Man Was Arrested For Allegedly Threatening A Company With A "Las Vegas Repeat"
Victor Casillas, 34, was arrested in midtown Manhattan and charged with making extortionate threats after allegedly sending murder threats to employees at a Colorado company, according to a complaint filed in Brooklyn federal court. The complaint does not name the company but states that it markets mobile to mobile applications that allow users to review and obtain promotional sales offers from various retailers. Users may earn credit from the company by submitting proofs of purchases made using the offers. Over time, users may exchange these credits for money. The company also gives users money for referring new users to the app. According to the complaint, Casillas first opened an account using his email addressed in September 2014. Since then he has opened an additional four accounts using various email addresses. The company reviewed these accounts for potentially fraudulent efforts to generate referral bonuses and ultimately closed the accounts and issued Casillas $40 payment. According to the complaint, though, in early 2017, Casillas opened more accounts to allegedly collect more referral bonus. This time, after the company reviewed the accounts and locked and deactivated them, Casillas began sending threats to the company via his email address and the company's app. 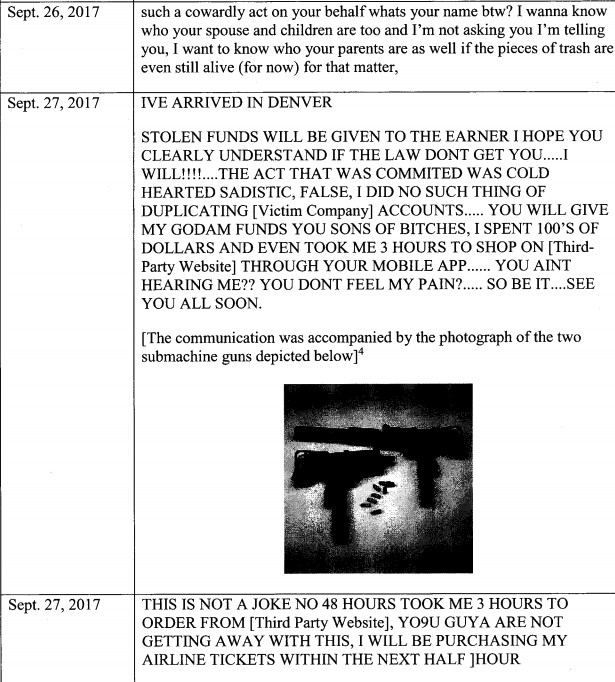 A number of threats sent in September included images of two MAC-11 submachine guns. One message included the name of four company employees, including photographs. One of the names was suffixed with the word “decapitation,” according to the complaint. Casillas will appear in magistrate court Wednesday afternoon. He was charged with making extortionate threats and faces up to 20 years in prison if convicted.